Post 126: Home to Maplewood Acres, On - A Snails Life and Lovin' it! We arrived back to what we refer to as home 🙂 at Maplewood Acres RV Park on May 14th, 2018. It felt good to be back to a familiar place. The campground looked clean and fresh. Many of the sites were empty. Only Seasonal folks like us were coming in. See our previous post for Maplewood Acres for more details 🙂 please. As we were settling in, we heard a familiar voice call out to us “Welcome home Joy” making us laugh. Yes it was good to be home. :). Within the week, we had a new sun kitchen erected with our brand new picnic table tucked inside. We planted some colourful flowers in canvas bags to decorate around the tree out front. 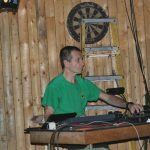 Dave (the owner) told us, our site had been revamped. We had a new drainage system installed. Dave put down grass seed which was beginning to grow :). Everywhere we went, people were welcoming us back. This really made us feel at home and glad to be back. This all happened on the July 1st weekend which was blistering hot this year. 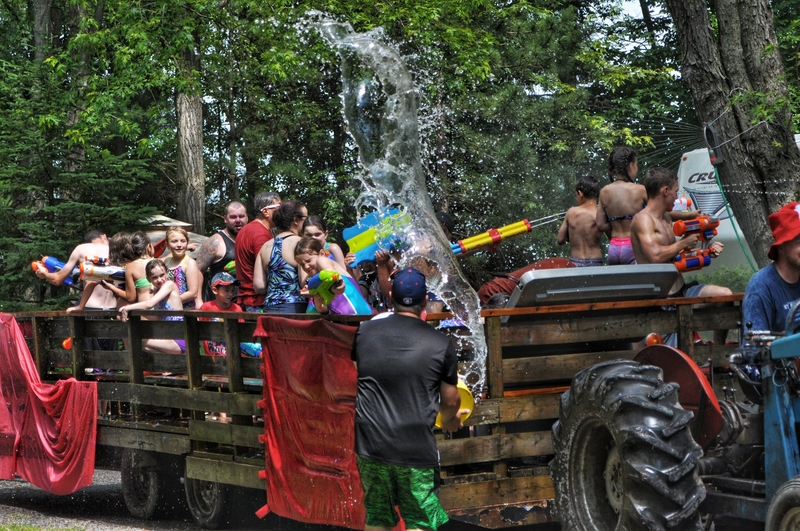 Maplewood Acres took full advantage of the heat with their traditional “Water Fight Parade”. We have to say this is the most unique and FUN campground we have ever stayed at lol. 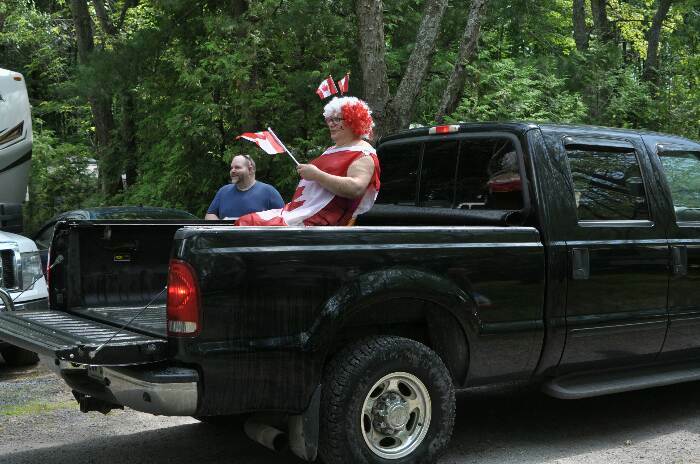 The Parade consisted of a pick up truck with a person in the back of the truck in a red and white huge wig, covered in a Canadian Flag sitting in a chair facing backwards calling out HAPPY CANADA DAY!! Our camp host Dave was on the hay wagon joining in the fun. The hay wagon was being pulled by his ever faithful tractor. 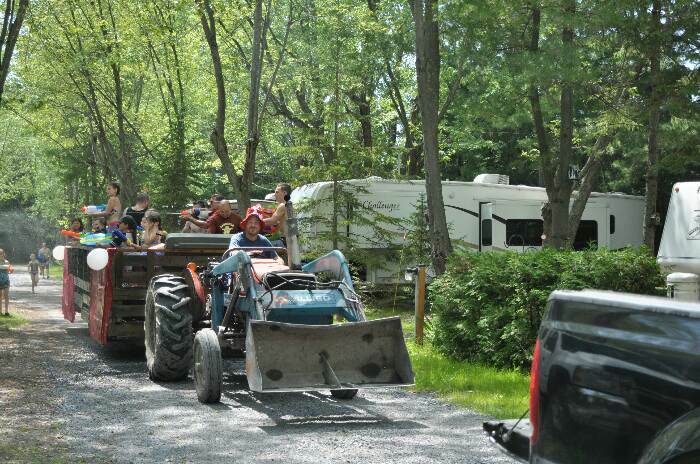 The tractor was pulling his massive hay wagon filled with screaming children and adults ARMED WITH WATER GUNS!!!! 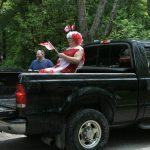 As this small parade crept along the roads of the campground calling out HAPPY CANADA DAY!! The wagon full of kids and adults soaked anyone they could that were watching the parade. People watching the parade were ready for them lol. Most of the campers had their hoses out, or buckets of water. 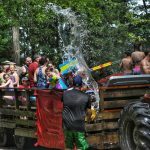 Some even had water balloons and were spraying back at the wagon as it went by. Bill had our hose out and was in the thick of it. He got soaked and was laughing the whole time. Joy was standing to the side taking pictures. As the kids took aim at Joy she called NOT THE CAMERA, NOT THAT CAMERA. Dave helped out and saved Joy by calling that out too. Phew, Joy stayed dry lolol. 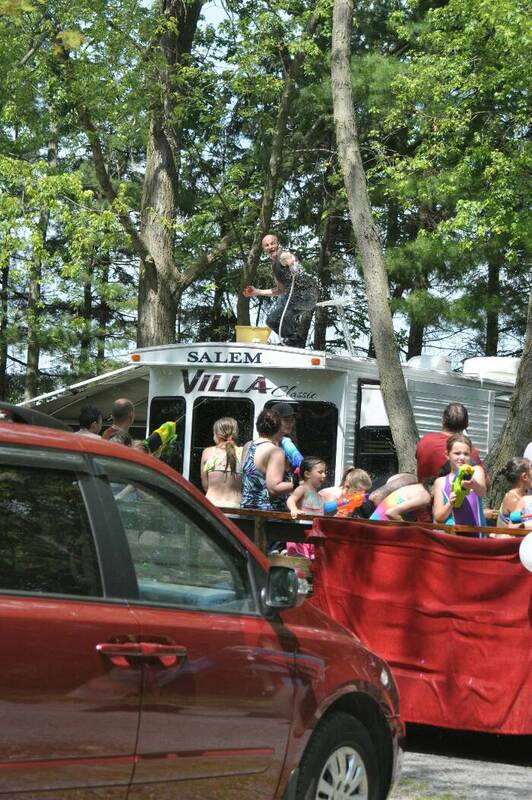 Bill followed the parade down around the corner with the camera and caught one man up on a friends trailer roof top. He was armed with a hose and buckets of water and water ballons lol. He has been in the campground for a few years. This was great fun for everyone with the temperatures in the mid 30s C that day. 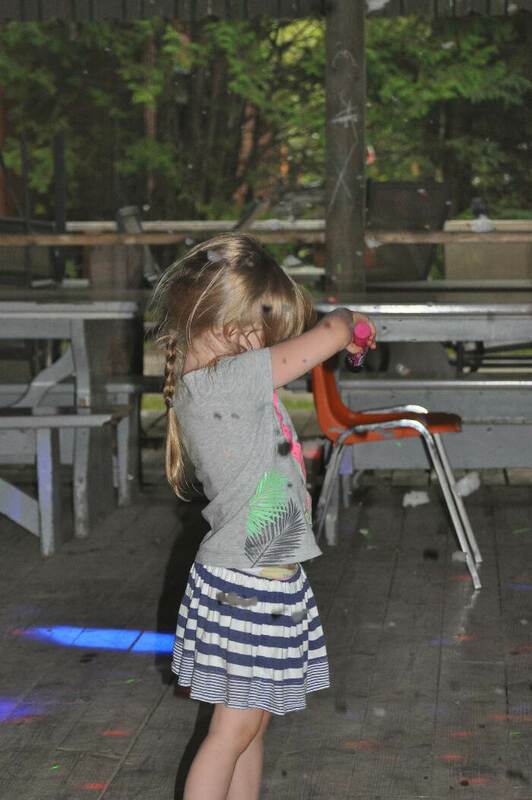 The first Dance of the year was great fun. 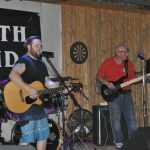 The live band “SOUTH WIND” is comprised of people from the campground and friends. These talented guys can play just about anything you asked for. They have the Clubhouse rocking pretty quickly. We love to go and watch and listen. The crowd ranges from tiny little people who can barely walk yet here they are bopping to the music through to pre-teen right up to grandparents. 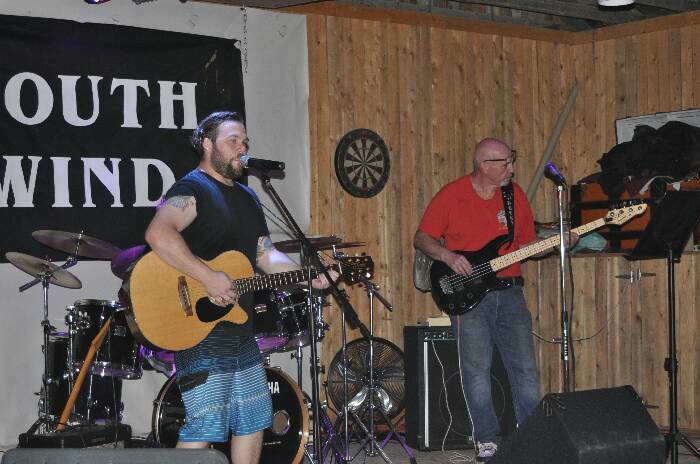 Everyone enjoys the sounds of SOUTHWIND. Line dancing always seems to find a song or two to take over the dance floor with many jumping up to join in. 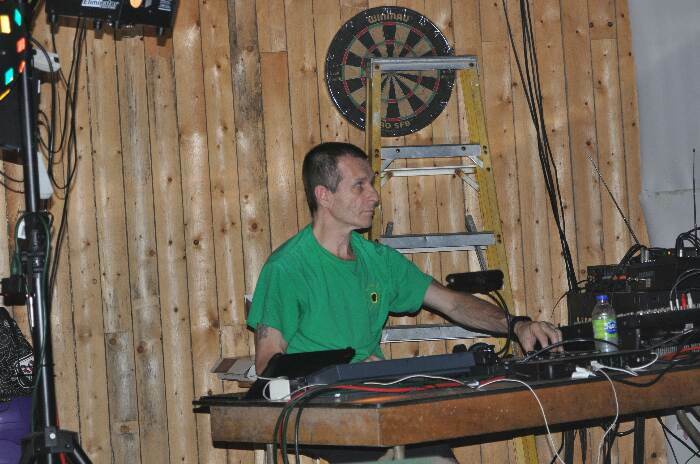 Special effects and sound man. A very interesting fellow, mans the lights and effects. You will find dancing lights on the floor, ceiling walls one minute. The next minute you will find your head covered in foam. Smoke surrounds you as you are dancing. The kids just love this as they dance around the adults. Yes, as we mentioned, this is a very unique campground, we wouldn’t miss the many events for anything. During our travels the last few years, we have stayed at hundreds of ‘campgrounds’. MapleWood Acres is by far the best!